Stephens Waring Yacht Design is glad to share some photos sent to us from our friends at Reuben Smith's Tumblehome Boatshop. Last fall Reuben commissioned us to design a modern classic for his client, a local gentleman looking for something a bit different than a restored 1920's Gold Cup racer -- he sought the same feel of varnished mahogany and hand-rubbed leather, but with modern amenities, performance, and trouble-free reliability and durability. Accordingly, we drew a completely fresh take on the classic speedboat-- a barrelback with dramatic tumblehome and flare, with a clean deep-vee bottom, chine flats for stability and spray suppression, and cold-molded wood/epoxy construction for solidity and low maintenance. A 21st-century V-8 engine with fuel injection and electronic ignition keeps her running smoothly without the greasy fingers and bashed knuckles inherent in maintaining a classic engine. Here are some photos of her in built at Reuben's shop in Warrensburg, NY. 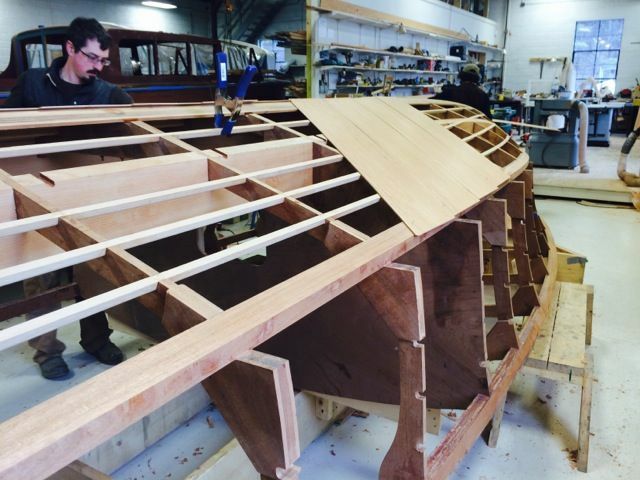 The bottom planking is being installed over her mahogany battens and Douglas Fir engine stringers -- three layers of mahogany, glued together under vacuum-pressure then fiberglassed. A June launch is planned, followed by an exhilarating romp down the lake at 60mph!